In the world of sole entrepreneurship, referrals are absolutely essential to growing your business. Of course, a business with endless referrals would be a utopian state. In today’s episode of the Referrals Podcast, we’re going to share a secret, getting endless referrals is as simple as expressing appreciation. On this episode of Referrals Podcast, we welcome Shawn Woods. Listen now to hear Shawn’s amazing and inspirational story for how leading with generosity led to a prosperous real estate practice and being the most-referred agent in the practice. On this episode of the Referrals Podcast, we welcome Rita Driver to the show. Rita has her own brokerage in Memphis: All-Stars Realty. We’re also talking about why niche markets are about problem-solving and chatting about the important benefits and tactics of serving a specialized market. Who are the soldiers in your army of ambassadors? In this episode of Referrals Podcast, we welcome Nat Wallen and discuss one of the most effective roles to draft into your army of ambassadors. What does generosity mean to you? More importantly, what does generosity do for you? On this episode of the Referrals Podcast, we are talking off-the-cuff and unplugged about generosity. On this episode of the Referrals Podcast, we welcome Emily Carew realtor and client events director out of Melbourne. Out of all the outreach channels you could select to contact clients, do you know which one is best? If you’ve been listening to the podcast and teetering on the edge of hosting your own event, we’ve got one message for you: Get in the game, it’s time to go! On this episode of the Referrals Podcast, we welcome special guest Dan Balzer who shares how to evolve your events to grow over time. On this episode of the Referrals Podcast, we welcome back Brandon Nelson to share his amazingly inspirational story on how he got $8 million in listings from one client. On this episode of the Referrals Podcast, we’re addressing a viewer request to focus on networking! Our special guest Jodie Osofsky is a realtor and today she shares some of her top tips for creating a community- and referral-building event. Here on the Referrals Podcast, we’ve covered in great detail how to host your own events to build up a referral database. Today, we’ve got a very special guest - Brandon Nelson. Brandon, of Brandon Nelson & Partners out of Bellingham, Washington, is sharing his success in fundraising events. When it comes to your database of prospects, do you have analysis paralysis? On this episode of The Referrals Podcast, we welcome Sandy Krestan. In addition to her work in real estate, Sandy is a certified 7L coach and an expert in creating a military-grade database. One great method to kickstart your year is to implement The January Call. It’s an incredibly simple, yet personal way to quickly build rapport with your client base and earn more referrals. On this episode of the Referrals Podcast, we welcome Sheryl Nolan to help us explain how it works. On this episode of the Referrals Podcast, we welcome back Karla Pierskalla. Amazingly, Karla moved her business to a new city and still grew from 40 to 212 clients in a short time. Listen as Karla shares how she did it. We’ve talked about events in the past, but today we’re going to get deep into how to create events and how to do it the right way. In this episode of the Referrals Podcast, we welcome back Toril Schoepfer. On this episode of the Referrals Podcast, we welcome Toril Schoepfer. Toril runs the Toril Sells Houses team and has been featured in Realtor Magazine’s “30 under 30” and Risk Media’s “Realtors on the Rise” list. Of all these impressive milestones, perhaps the most outstanding his her dedication to giving back. When you execute an effective Yearly Appreciation Plan, you’ll be amazed at how quickly referrals and revenue will grow in your business. In this episode of the Referrals Podcast, we continue our conversation on building a business around generosity and appreciation. Referrals can be one of the most powerful tools in your business. 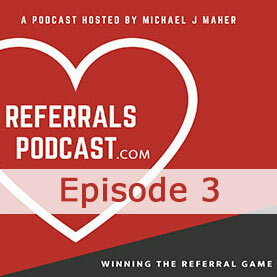 In this episode of the Referrals Podcast, we’ll explore one of the most impactful parts of your referral arsenal - the retrace. This week we chat with Neal Smith, whose mortgage practice is run 100 percent by referrals! In this episode of the Referrals Podcast, we discuss how to use events purposefully and strategically. Special guest Don McNaughton convinces us why doing events can help us be referable as individuals and build a referral business. In previous episodes of the Referrals Podcast, we’ve shared why giving gratitude through the simple handwritten note is so powerful. In this episode, we welcome a very special guest: John Israel. John has started a global movement - the Mr. Thank You Project - that has a simple, yet massively ambitious goal. If you listened to our earlier episode on Notevember, our annual celebration of giving handwritten notes, you’ve already heard how passionate we are about them. In this episode of the Referrals Podcast, we welcome Arnel and Tara, two entrepreneurs who have had outstanding business traction with the humble Power Note. Some people may look at the 7L, or seven levels of communication, and think that it applies only to realtors, but Karla has been very successful applying these principles to her position with her title company. In this episode of the Referrals Podcast, we welcome Karla Pierskalla, whose passion is recognizing the potential in others. Isn’t it ironic? The one month of the year dedicated to giving thanks and celebrating veterans begins with the word “no.” In this episode of the Referrals Podcast, we welcome Josh Purvis as our guest to help us honor the true meaning of this month and explain all about NOTEvember, the celebration of the tried-and-true handwritten note. In this week’s episode, we continue our conversation with Bob Burg to uncover the power of genuine influence in business and beyond. Bob has spurred a worldwide movement by challenging the conventional wisdom of success and we share some of his best advice today. In this episode of the Referrals Podcast, Michael and Chris speak with Bob Burg, author of “The Go-Giver” business book series. Bob has spurred a worldwide movement by challenging the conventional wisdom of success. In this, the tenth episode of the Referrals Podcast, Michael and Chris wrap up their series on rituals. We’ve covered morning and evening rituals, and in this final episode on the topic, we’ll cover pre-leave rituals. Pre-leave rituals happen right before the close of each work day and are critical to the success of the next day. It’s time for some sweet dreams! We’ve delved into morning rituals and Sunday night rituals to help pre-decide important decisions that can save time and stress and kick off your week properly. How you start your week is one of the most important rituals you can master. It’s the difference between feeling confident and composed or chaotic and confused. Many people head into their work week without this all important practice and feel the exhausting toll it takes. In this episode, we discuss the key elements of the Sunday Night Ritual and how you can implement it into your life for better more energy and confidence at work and home. How do you set your life up for success… on purpose? Rituals have long been a source of focus and productivity for top performers. In this episode of the Referrals Podcast guests Jenn and Tony Scarpero share best practices for morning rituals from the Miracle Morning. Time, money and energy are critical resources for growing your business. Who you spend those resources on matters. In this episode of the Referrals Podcast we share 2 important and effective strategies for grading your database, so you can be more referrable and more profitable. To build a solid referral business you need ambassadors for your business. The good news is that you already have ambassadors in your database as well as people who could become ambassadors if you nurtured the relationship properly. In this episode of the Referrals Podcast we talk about how to cultivate these ambassadors by grading your database so that you are focusing your time, money and energy on the relationships that have the biggest ROI. When growing a referral business it's important that you focus your resources where you get the most return. In this episode of the Referrals Podcast we cover the Communication Pyramid from the 7 Levels of Communication book and how to be the most effective with your time, money and energy. Referral relationships are the cream of the crop. So how do you start one of these important relationships? In this episode we show you how to start a referral relationship, the questions to ask and what this kind of conversation sounds like. In this episode we talk about the inspiration behind the Referrals Podcast, the 7 Levels of Communication book and having a business that feeds your soul. With so many podcasts now, why do we need another one? In this episode we cover the heart of the Referrals Podcast and how this show will help you get more referrals.